As a child this salad would have been my worst nightmare! Disliked eggs, blue cheese, and pretty much anything green. 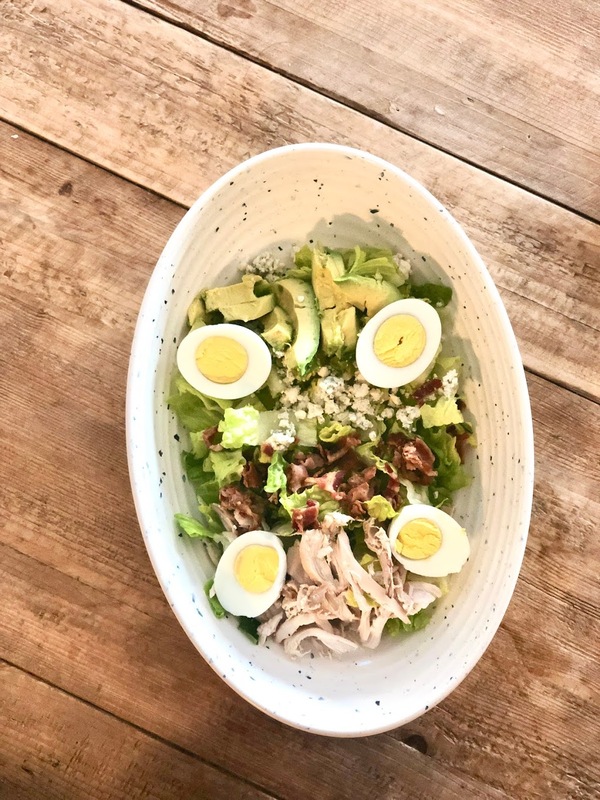 Now as an adult, the Cobb salad has been one of my favorites. Here is my go-to when I need an easy salad to whip up. Typically I make this salad when we have some leftovers in the fridge that we need to get rid of. This is inspired by a salad I like to grab from Rustic Bakery here in Tiburon. Hard Boiled Eggs: Easiest way is to add one inch of cold water over eggs with a splash of white vinegar, bring to boil, cover, take off the heat, and let sit for 12 minutes. Use a slatted spoon to transfer into a bowl with a few ice cubes and then peel. Bacon: I like to cook it up for breakfast a few days before, make a little extra, cut pieces up, then take out when I go to make this salad. Shredded Chicken: I make batches of shredded chicken often in my Instant Pot and then store it in the fridge for a while. Cherry tomatoes sliced: Jumped the gun on taking this shot. Didn't get the tomatoes in! Dressing: 2/3 cup Olive Oil, 1/3 cup red wine, 1 tablespoon dijon mustard, salt & pepper to taste.